4:4 Round the throne were twenty-four thrones, and seated on the thrones were twenty-four elders, clad in white garments, with golden crowns upon their heads. These 24 elders appear in a number of places in Revelation. 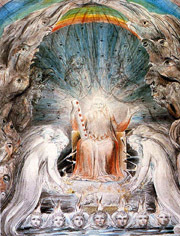 Here in chapter 4 and later in chapter 14 they sit around the throne of God. In chapters 4, 5, 7, 11, 14, and 19, they worship and praise God. Who are they? Let’s consider the clues. The 24 elders wearing golden crowns and sitting on 24 thrones before the Great Throne represent royalty in the presence of supreme royalty. They sit on thrones surrounding God’s throne, which indicates that their power is given them by God. Their white garments may represent the righteous deeds of the Saints as it does later in 19:8. The crowns remind us of the victory crowns we saw in 2:10. These 24 elders also represent a priesthood. Recall from 1st Chronicles 24:1–19 that there were 24 orders in the Levitical priesthood. Each of these orders had an elder who was sometimes called a prince or a governor (1 Chronicles 24:5). The Levites sometimes praised God with harps (1 Chronicles 25:6), and we will see harps later in 5:8, where we will see the 24 elders performing priestly duties. Thus, what we have in these 24 elders is a royal priesthood. Where have we seen that before? 1 Peter 2:9 describes the church as a royal priesthood. What we are seeing here is the church. Their white robes are the white robes promised to the faithful in 3:4. Their crowns are the crowns promised in 2:10. Their thrones are the thrones promised in Matthew 19:27-29. These elders are the faithful people of God! The church of Christ is a royal priesthood, just as Christ himself is both our King and our High Priest. Zechariah 6:9–15 depicts the High Priest being crowned with a crown, which could only happen after the Old Law had passed away since under the Old Law the priests were from the tribe of Levi and the kings were from the tribe of Judah. Psalm 110 also tells us that Jesus is both king and priest. Why 24? One reason we have already mentioned is that 24 points us to the priesthood in 1 Chronicles. Others see 24 as combining the Old Testament (12 patriarchs) with the New Testament (12 apostles), which would thus depict all of God’s people from every age. 5 From the throne issue flashes of lightning, and voices and peals of thunder, and before the throne burn seven torches of fire, which are the seven spirits of God; 6a and before the throne there is as it were a sea of glass, like crystal. • Exodus 19:16 On the morning of the third day there were thunders and lightnings, and a thick cloud upon the mountain, and a very loud trumpet blast, so that all the people who were in the camp trembled. • Psalm 18:12-14 Out of the brightness before him there broke through his clouds hailstones and coals of fire. The LORD also thundered in the heavens, and the Most High uttered his voice, hailstones and coals of fire. And he sent out his arrows, and scattered them; he flashed forth lightnings, and routed them. • Psalm 77:18 The crash of thy thunder was in the whirlwind; thy lightnings lighted up the world; the earth trembled and shook. • The breaking of seventh seal in 8:5. • The blowing of seventh trumpet in 11:19. • The pouring of seventh bowl of wrath in 16:18. The seven torches of fire are the seven spirits of God, which, as we saw before, most likely represent the Holy Spirit, with “seven” being used to denote the perfection of the Spirit. A torch of fire is a particularly good symbol for the Holy Spirit. The Holy Spirit appeared as “cloven tongues like as of fire” in Acts 2:3. Like a torch of fire, the Holy Spirit is a revealer; he makes all things clear. John in particular knew what a separating sea meant! He was in exile on an island. In 21:1, we will find that the sea is no more! As with the 24 elders, the four living creatures that we meet here will also reappear later in the book. We will see them again in chapters 5, 6, 7, 14, 15, and 19. We are also told that the cherubim are God’s chariot on which he rides swiftly to judgment. • Ezekiel 10:16 And when the cherubim went, the wheels went beside them; and when the cherubim lifted up their wings to mount up from the earth, the wheels did not turn from beside them. • Psalm 18:10 He rode on a cherub, and flew; he came swiftly upon the wings of the wind. We are also reminded of the seraphim from Isaiah 6:2-3. The seraphim are mentioned only by Isaiah. They may be the same as the cherubim, with the name “seraphim” being used by Isaiah to describe their dazzling appearance. There are differences among the descriptions of the seraphim in Isaiah, the cherubim in Ezekiel, and the creatures in Revelation, but they may nevertheless be different symbolic descriptions of the same beings. (Remember one of our interpretive principles: Dissimilarity of symbols does not necessarily imply distinctness of subjects.) Isaiah’s seraphim have six wings; Ezekiel’s cherubim have four; John’s living creatures have six. 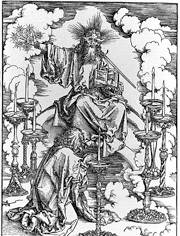 Ezekiel’s cherubim have four faces each; John’s living creatures have one face each. The purpose of the cherubim is to defend God’s holiness. They kept Adam from the tree of life. They were woven into the veil that stood between man and the presence of God in the temple. They stood over the ark of the covenant looking down upon the law of God. They would have demanded immediate justice were it not for the mercy seat that covered the transgressions because of the blood that was sprinkled there. These creatures are the judge of all who enter the presence of God. They are endlessly concerned with God’s reputation and the vindication of his character. They never cease to say, “Holy, Holy, Holy is the Lord God Almighty.” Think of these creatures the next time you hear someone use the name of God in vain. They are watching! Praise the LORD from the earth, ye dragons, and all deeps: Fire, and hail; snow, and vapour; stormy wind fulfilling his word: Mountains, and all hills; fruitful trees, and all cedars: Beasts, and all cattle; creeping things, and flying fowl: Kings of the earth, and all people; princes, and all judges of the earth: Both young men, and maidens; old men, and children: Let them praise the name of the LORD: for his name alone is excellent; his glory is above the earth and heaven. Why are there four creatures? The number four confirms our understanding that we see here all of God’s creation worshipping him. The number four denotes the created world — the four elements (earth, air, fire, water), the four seasons, the four directions. Compare Mark 13:27 ― “And then he will send out the angels and gather his elect from the four winds, from the ends of the earth to the ends of heaven.” Some say that 4 being 3+1 denotes the creative works (1) that come from God (3). These four living creatures are full of eyes: They miss nothing. They proclaim God’s holiness, his separateness, his transcendence, and his unlimited might and power. Here is the message of these verses in a nutshell: You think Rome is powerful and impressive? Just look at who we have on our side! Rome does not stand a chance! The elders fall down before God and cast their crowns before the throne and worship God. This shows that their authority is a delegated authority. They owe their existence and present status to God’s power and will. Notice that verse 10 in the Revised Standard Version tells us that these 24 elders were singing while worshipping before the throne of God. Other translations tell us that these elders were simply saying these words. Which is correct? The Greek word used here denotes speaking, and particularly denotes the content of the speech. Ephesians 5:19 does say, “Speaking to yourselves in psalms and hymns and spiritual songs, singing and making melody in your heart to the Lord,” but the Greek word for “speaking” used there is different and denotes the sound of the speech. Thus, it’s not clear at all why the RSV used “singing” in this verse, and it appears to be incorrect. In any event, we will hear the elders singing later in 5:9, and we will have more to say about music at that time. All of creation is the product of God’s will. Before anything was created, it had its existence in the mind of God. As Psalm 148:5 reminds us, “For he commanded and they were created.” When we study God’s creation we are thinking God’s thoughts after him. The scene of this chapter is one of unending worship of God by the cherubim and by the church. The creatures worship their Creator. By contrast, Romans 1:25 depicts sinful men worshipping the creature rather than the Creator — and that verse from Romans described Rome perfectly! The contents of this scroll will be revealed in the chapters that follow, but here we get a description of the scroll. It is written within and on the back, and it is sealed with seven seals. What we sometimes call a “book” was really a scroll. Scrolls of that day were typically made of single papyrus sheets about ten by eight inches. The sheets were joined together horizontally when a long scroll was needed. The writing was in narrow columns about three inches long. The roll commonly had a wooden roller at each end. It was held in the left hand, unrolled with the right, and, as the reading went on, the part in the left hand was rolled up again. The book of Revelation, for example, would have required a scroll that was about 15 feet long. This scroll was written on the front and on the back. In making papyrus paper, a row of papyrus strips was laid vertically with another row of strips laid horizontally on top of them. The whole thing was then moistened with water and glued and pressed together. The side that ran horizontally was known as the recto, and on that side the writing was done because the lines of the writing ran with the lines of the fibers. The other side was called the verso and it was not commonly used for writing. But papyrus was expensive. So, if you had a lot to write, you would write both on the front and on the back. A sheet written on the back, the verso, was called an opisthograph. That the scroll in God’s hand was an opisthograph (written within and on the back) tells us that it contained the extensive and comprehensive decrees of God. It contained the full will of God for his people and for the enemies of his people. That it is written tells us that God’s will in this matter has been determined, and it will happen. It has been decided. There will be no deliberation and no delay. We see similar language in the description of Ezekiel’s book of lamentations in Ezekiel 2:10 ― “It had writing on the front and on the back, and there were written on it words of lamentation and mourning and woe.” And Rome will soon find that for them the comparison with Ezekiel’s scroll goes beyond how it was written. For them, this scroll will also contain words of lamentation and mourning and woe. The seven seals on the scroll indicate that the scroll was perfectly and completely sealed. At this point, God’s plan had not yet been put into effect and had not yet been revealed. The judgments within the scroll had not yet been executed. But that is all about to change as the seals are removed. The use of a seal reminds us of Daniel 8:26, where Daniel was told to “seal up the vision, for it pertains to many days hence.” The period called “many days hence” in Daniel 8:26 was in fact about 400 years. By contrast, the seals are about to come off of this scroll, and in 22:10, John will be told not to seal up his book for the time is near! Again, we must ask on what basis some people argue that the events in this scroll have not happened even to this very day — 2000 years after the seals were removed! The question is not who is able to open the scroll and breaks its seals, but rather who is worthy to do those things. Whoever opens the scroll will be responsible for what follows. The word “worthy” (axios) literally means “of sufficient weight.” The word occurs 7 times in Revelation. We will see this (or perhaps another) strong angel again in 10:1 and 18:21. In Chapter 10, the strong angel will lift his right to Heaven and swear there will be no more delay, so when we see this strong angel we should remember the time frame of this book. No one in all of God’s creation was worthy to open the scroll and loosen the seals. And John wept. Why? If the scrolls were not opened then there would be no protection for God’s people, there would be no judgments against the enemies of God’s people, there would be no ultimate triumph for believers, and there would be no new heaven and new earth. John wept at the delay! And how would John have reacted had he been forced to read a modern commentary that says nothing in the book has yet been fulfilled even to this very day? How would he have reacted to that delay? We see here three descriptions of Jesus: (1) the Lion of the tribe of Judah, (2) the Root of David, (3) and we are told that he has conquered. Judah is a lion’s whelp; from the prey, my son, you have gone up. He stooped down, he couched as a lion, and as a lioness; who dares rouse him up? The scepter shall not depart from Judah, nor the ruler’s staff from between his feet, until he comes to whom it belongs; and to him shall be the obedience of the peoples. There shall come forth a shoot from the stump of Jesse, and a branch shall grow out of his roots. ... In that day the root of Jesse shall stand as an ensign to the peoples; him shall the nations seek, and his dwellings shall be glorious. Finally, Jesus is described as the one who has (past tense) conquered. Not that he is about to conquer, but that he has already conquered. Jesus conquered Rome at the cross! In fact, Jesus was conquering Rome at the very point that Rome thought it was conquering Jesus. Once again, things are not always what they seem! What is the purpose of this beautiful picture of Christ? This picture emphasizes how great a thing it is to which Christ is here called. He will sustain the kingdom he died to create ― and he will sustain us today. Jesus loves his church! Finally, it is self evident that God did not need to search for someone to open the scroll. God did not need to search for Christ. The searching, the waiting, and the weeping are presented for dramatic effect. The angel in verse 2 knew the answer to his question before he asked it! John looks over expecting to see a lion, but what does he see? He sees a lamb. In fact, he sees a lamb standing as though it had been slain. Where is the power in that? Again, things are not always as they seem. What is meant by the phrase “as though it had been slain”? It means that the Lamb had the marks of slaughter upon it. It does not mean that the Lamb merely looked like it had been slain; it means that the Lamb had been slain. And the marks of that event were still evident upon it. And this slain lamb is standing — a vision of victory through sacrifice and suffering. • John 1:29 The next day he saw Jesus coming toward him, and said, “Behold, the Lamb of God, who takes away the sin of the world! • 1 Corinthians 5:7 Purge out therefore the old leaven, that ye may be a new lump, as ye are unleavened. For even Christ our passover is sacrificed for us. • 1 Peter 1:18–19 Forasmuch as ye know that ye were not redeemed with corruptible things, as silver and gold, from your vain conversation received by tradition from your fathers; But with the precious blood of Christ, as of a lamb without blemish and without spot. • Isaiah 53:7 He was oppressed, and he was afflicted, yet he opened not his mouth; like a lamb that is led to the slaughter, and like a sheep that before its shearers is dumb, so he opened not his mouth. We tend to see a lamb as a docile and helpless creature, but we will find that this Lamb is very different. Later, we will read about the “wrath of the Lamb,” which is one of the most remarkable and striking phrases in all of the Bible. Why does this lamb have seven horns? Horns were used by the Hebrews to depict power. (Deuteronomy 33:17; 1 Samuel 2:10) The seven horns here represent Jesus’ complete and perfect power and wisdom. Later in Revelation (and also in Daniel) we will see that horns are used to depict kings. Thus, these seven horns likely depict the royalty of Christ and his complete sovereignty over all things. A major theme of this book is the power of prayer. We will soon see that this judgment against Rome is happening because of the prayers by God’s people. Yes, we are to love our enemies and pray for them, but sometimes that prayer can be that God will judge them, and perhaps in that judgment they will finally see the errors of their ways. In these verses, “Heaven is revealed to earth as the homeland of music.” We find here the greatest chorus of praise the universe can ever hear. This new song is a song of redemption. It is a song about Jesus and about his church, the ransomed from the earth. One more comment about singing: Do angels sing? Most of us would likely answer yes. But interestingly there is a not a single example anywhere in the Bible of an angel singing. The closest we get is in Job 38:7 ― “The morning stars sang together and all the angels shouted for joy." (Hark the Herald Angels Say? It just doesn’t have the same ring to it!) Also, did you know that God sings? See Zephaniah 3:17. And, in my opinion, angels also sing. How could they not?